The Internet has led to a shift in the way many individuals complete everyday tasks, such as shopping, reading and communicating, and a new online resource may impact the way people learn languages worldwide. 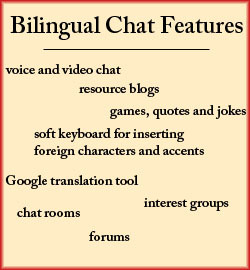 Bilingual Chat is a social networking site in which language learners have the opportunity to talk with native speakers through forums, instant messaging and video and voice chatting. The free resource was established in April of this year, and several Elon faculty and students say they think the website has the potential to be an effective learning tool. “My overall reaction from when I first saw it is that it seemed very much like Facebook, but just a lot more productive,” Shannalee Van Beek, an Elon senior, said. The website has features similar to those found on Facebook, allowing individuals to send and receive friend requests, check a newsfeed and join groups. Van Beek, an Arabic tutor on campus, has signed up for an account in hopes of using it to practice Arabic, Dutch and Spanish, saying that the site may offer learning opportunities that tend to be absent from the classroom experience. Jamie Sprenger, a 2008 Davidson graduate, created the website after struggling to find a way to practice Spanish and Portuguese. “I decided that since what I needed wasn’t available, I’d create it myself,” Sprenger said. The site boasts the advantages of its services, including the opportunity to learn about international culture and travel and a break from vocabulary memorization. Nicole Librandi, adjunct foreign language professor at Elon, says Bilingual Chat can serve as a nice supplement to classes or books. “It would be different from the classroom experience specifically because it would provide a real-life chance to use Italian,” she said. According to Samuele Pardini, associate professor of Italian, there is a significant difference between language theory and experience, something he experienced when first learning English. This applies to languages, with tenses used differently than what may be found in a textbook, accents changing from one location in a country to another and the speed at which native speakers communicate much faster than that of a fellow student, he said. Both Librandi and Pardini said they would suggest the site to students, but understand some of the limitations. “I have already mentioned it to my students, some of whom were interested, but others were leery of it, worried about potential inappropriate partners,” Librandi said. This is a really interesting story about a new tool I did not know about. You have a typo in the third paragraph – missing a space between words. You did a GREAT job framing the video clip well, in a nice setting and Van Beek was a good interview. Too bad the airplane flew over right when you were shooting it! It’s not too distracting to hear the plane, but it was all so perfectly set up otherwise that I feel for you!